So much of the ministry we saw in South Asia was good news to the local community. 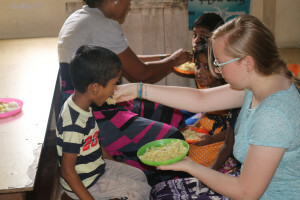 Whether it was in the drug rehab centre working in the slums of Colombo or the Christian hospital treating snake bites in Varanasi, it was very good news to the locals. As a result such organisations are thought of highly and attract a constant stream of people to engage with. This has made me wonder in what ways we are ‘good news’ in Rayners Lane and Harrow? The Holiday Bible Club generates lots of good will, plus Food Bank collections and the council’s use of our premises all count too. However, I’m sure that those things are just scratching the surface. We need to do some research into what are the greatest needs of our community and how best we can share the love of Christ locally. This comes down to the relationship between evangelism and social action. The UK church has been arguing over this for about 100 years. Generally speaking, traditionalists are wary of social action because they feel (with some justification) that it tends to lose a grip on the gospel. And progressives are supportive of social action because they think (with some justification) that just preaching at people has no relational context and is not loving. So, where do we go from here? Is there a way out of this impass? To start with we must always keep the gospel the main thing. The gospel is central to everything we do. It is not the way into the Christian life only, it is the Christian life. The gospel is not just something we tell people so that they become a Christian, and then go on to other things. Rather the gospel shapes how we behave as well as what we believe. Let me use an analogy. When my daughters were little they both got chicken pox. (I had to drive around the Lake District in the pitch black at night to get Sophie to sleep, but that is another story.) While their bodies were fighting the virus we did all we could to relieve their discomfort. Camomile baths, you know the sort of thing. Now, we knew we were not treating the virus. All we were doing was helping with the symptoms, but we did it because we loved them. A loving parent keeps treating the symptoms until the disease is fully cured. So it is with any social project. If we love our neighbours we will want to help treat the symptoms of sin in our fallen world. And we will be happy to do so regardless of whether they become Christians or not. However, we will always want to point them to the only cure for their condition and we will never kid ourselves that we are doing anything more than giving temporary relief of their symptoms. Therefore attitude and motivation is essential. There is nothing wrong with churches getting involved in ‘purely’ social action projects. But only if we always keep in mind why we are doing it and what we are achieving. The moment we start thinking that treating their symptoms is the main game then we have lost the gospel. 1. Pride – a tell-tale sign that things are going wrong is when people start talking about all the ‘good I am doing’. ‘Wow, we are really making a difference in people’s lives.’ Notice it is not God and his gospel changing people, it is me. One representative from a parachurch organisation told me that their aim was ‘not to preach the gospel, but to be the gospel.’ I think (I hope!) I know what he meant – i.e. They do not preach to people but only share the gospel if those they work with ask. However, the phrase itself is deeply troubling. The Greek word for ‘gospel’ means ‘a proclamation of good news’. Like a town crier shouting out a famous victory that ends a war. If I ‘am’ the gospel then what I’m saying is that the help I’m giving this programme is much better news than anything Jesus did 2000 years ago. Again, I’m sure the phrase is not meant that way, but that is what it means. Who is making the world a better place? Is it me or is it Jesus? In Matthew 5 Jesus tells us to be salt and light. He expects people to see our good deeds, but to praise our Father in heaven as a result. Who gets the glory for our good deeds? 2. Self-righteousness – linked to pride in our own abilities and resources to help people comes a pharisaical spirit. What I’ve noticed is that when we lose our confidence in the gospel we forget that we are all sinners saved by grace. Then we start to look down on people who are not helping in our ministry. ‘Don’t you care about the poor? You can’t really be committed to Christ if you don’t volunteer at the food bank!’ A few years ago research showed that people who are environmentally conscious are often willing to trade that ‘goodness’ off with other areas in their lives. E.g. ‘I’m really good at recycling and so it doesn’t matter if I steal or lie a bit.’ Deep down we are all little legalists who think we can save ourselves. Social action programmes can encourage us to think that we are much better than everyone else. 3. Frustration – as soon as we forget that we are dealing with symptoms and that only Jesus can deal with the root cause we will get frustrated. ‘The poor you will always have with you.’ There will always be more poor people to help, more sick people to heal, more depressed people to comfort. If we seek to tackle the problems of the world in our own strength then we will quickly be overwhelmed. When serving becomes a chore it probably means that you’ve lost your gospel motivation. Therefore it is all about vision and leadership. Let’s get more involved in helping our local community but make sure that the vision for every project is always gospel focussed. Once more, that does not mean that everything has to be explicit evangelism but it is more to do the motivation and bigger picture of those involved. And for that vision to be maintained we need leaders who buy into that vision and keep it always before their team. I think RLBC needs more community engagement, but ministries staffed by church members who are so committed to Jesus that they can’t help sharing about him when they volunteer. A church full of people who love their neighbours so much that they want to tell them about the cure as they help them with the symptoms. This was what I loved about Sri Lanka and India. They were not ‘preaching’ at those who came to them, and yet there were frequent opportunities to talk about Christ. My prayer is that becomes the same at RLBC.